The forthcoming Surface Water Toolbox combines the popular U.S. Geological Survey SWSTAT tool with the U.S. Environmental Protection Agency’s DFLOW tool. The finished product will be able to perform advanced computations to model a diverse set of surface-water streamflow metrics. U.S. Geological Survey Office of Surface Water. 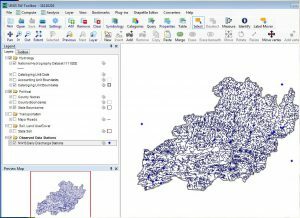 The U.S. Geological Survey (USGS) is working with the U.S. Environmental Protection Agency (EPA) to combine two popular streamflow analysis tools into a single, integrated resource. The Surface Water Toolbox (SWToolbox), which has not yet been released to the public, will allow users to compute an extensive number of metrics associated with modeling how surface water moves through watersheds. SWToolbox will meld the USGS Office of Surface Water’s SWSTAT software, which enables intensive statistical analysis of surface water time-series data, with low-flow analysis modeling and narrowly tailored water quality compliance information from EPA’s DFLOW tool. When ready for release, SWToolbox will be of particular use to regulators, hydrologists, watershed managers, or others interested in modeling biologically or hydrologically based surface-water design flows, according to USGS. The components of the SWToolbox are a natural fit for each other. EPA’s DFLOW tool requires extensive data about stream properties in order to make calculations, and the USGS maintains a wide-ranging database of streamflow data for nearly 28,000 waterways in the U.S., updated automatically each day. SWToolbox will streamline the process of importing USGS data into the program. The two agencies are actively seeking feedback from testers before the tool’s public release. The latest prototype version of the software will be available beginning the week of Jan. 29, according to USGS. A user manual is forthcoming from USGS. Download the tool here, and send questions or concerns to SWToolboxTesting@usgs.gov. Jenny Molloy, lead environmental protection specialist for EPA’s Water Permits division. Learn more and register for the webcast here, and contact chien-hale.miranda@epa.gov by Feb. 1 if you require special accommodations.